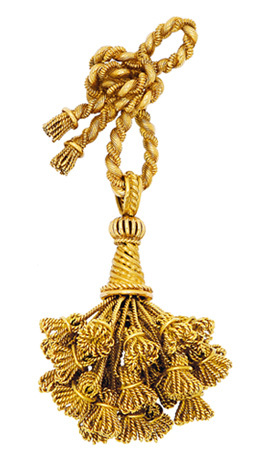 This 18-karat signed Herm√®s gold brooch is corded wirework and designed as a knot suspending a tassel. It is numbered 88385 and has French assay marks. With Baby boomers entering their retirement years, good period pieces are springing up everywhere. As a dealer of estate jewellery, you need a keen eye for detail and experience to spot an item worth adding to your collection. To begin, examine every part of the piece, front and back, to determine its authenticity. Look for signs of repair in older jewellery. If the piece has been repaired too many times, consider using it for parts. Remember that each period called for a unique style alongside some contemporary interpretations of classics. For instance, not all jewellery manufactured from 1915 to 1935 was Art Deco, and not all Art Deco is of top-notch workmanship. Suffice it to say, all true Art Deco pieces are historic and highly prized. Understand the value of an item before purchasing it. Otherwise, you many be overpaying. If you like a particular piece and are willing to live with it for a while, then you‚Äôll probably make money on it. We are always more successful selling something we truly love and, in fact, don‚Äôt mind retaining. Other pieces may not appeal to you as much, so plan to unload those quickly to other dealers, even at cost if necessary. For dealers who also carry new jewellery, focus on buying estate items that fit with your inventory in terms of workmanship and range of value. In other words, be consistent with your standards ‚Äì inspect a potential purchase thoroughly to detect any alterations, poor repair jobs, or replaced parts. In addition, be careful not to duplicate purchases. There could be a reason an estate piece in your case has not sold; adding a similar item may not be a wise use of precious funds that could be better spent on more variety and excitement. Wait until the right pieces come along to round out your collection. Look at everything you come across, learning from it and honing your skills. You may also consider advertising your interest in purchasing estate pieces and/or attending auctions. Other dealers are always happy to discuss their collections. Also, there are many books on the market that discuss the historical influences of various periods, important makers, and styles. 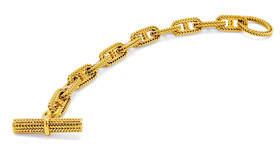 An 18-karat signed Herm√®s gold bracelet of textured mariner linking design. Numbered 98022 and with French assay marks. A signed Cartier Art Deco bracelet with continuous series of onyx rondelles between diamond-set connectors. This piece is mounted in platinum and numbered 2305. Art Deco enamel and diamond brooch. The elongated black enamelled forms on this signed Cartier piece are accented at regular intervals by old European-cut diamond collets. Mounted in platinum and 18-karat gold with French assay marks. Reproduction jewellery is now becoming far more difficult to detect, but that‚Äôs part of the challenge and where your growing knowledge can really make all the difference. In fact, there are designer manufacturers specializing in extremely well-made reproductions using the same materials as the originals. Some even go so far as to utilize gem cuts in the same fashion as the period being represented. Familiarize yourself with the prices certain types of pieces command at auction and offer accordingly. Over time, a dealer learns what is in demand and worth purchasing for resale. In general, estate jewellery made prior to 1950 is considered a period piece. Signed jewels made pre-1950 are the most prized finds, while such pieces from Bulgari, Cartier, Hermes, Buccellati, Tiffany & Co., Van Cleef & Arpels, and David Webb made after 1950 are also in high demand. Keep in mind not all estate jewellery is created equal; some pieces should simply be scrapped or cannibalized for parts. While there will be more and more great estate jewels coming onto the market in the next 20 years, there is sure to be as many new buyers competing for these items. These days, a significant portion of sellers are in their 80s and 90s, while those inheriting pieces are in their 50s and 60s. With these two demographics expanding quickly, this is the time to prepare by getting involved early on. Many of the baby boom generation now in their 50s and 60s do not have their parents‚Äô lifestyle and have no use for these heirlooms. While estate jewellery is often purchased for its historical significance, sentimentality may also play a role- a customer may simply buy a piece because it reminds him or her of something their grandmother wore. The timelessness of these jewels is also a factor, as they convey the sense of lasting value. Many of these heirloom pieces do blend in nicely with quality fashion accessories. 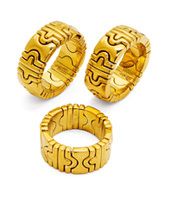 Buying estate jewellery requires a practiced, yet sensitive, approach. While a seller‚Äôs collection may not be the best of the best, it may still represent fond memories for him or her, whatever the reason for cashing out. Making an offer to purchase should take this into consideration without appearing to insult the item or the seller. Remember, tact, not tactics. It‚Äôs always a good idea to ask about a person‚Äôs reasons for selling, even if he or she may not want to be perfectly forthright. Is it a matter of needing cash fast? Getting rid of an unwanted piece? Perhaps consignment or a trade-up might suit the customer better? Try engaging him or her in a discussion and gather information. You may ask how long they‚Äôve owned the item, where it came from, the original weight of the main stones, and the market value. On this last point, you may have to educate the customer on the meaning of the appraised value for insurance purposes. In cases where you really don‚Äôt want the item due to existing inventory or because it‚Äôs simply not your market, explain the situation and make your offer accordingly. Alternatively, you may suggest another venue where the customer may be better served. Again, avoid making an offer that may offend the customer. The bottom line is to leave the client with a positive experience-treat him or her with the same respect and courtesy you would if they were making a purchase from you. You may just end up with an exciting piece to add to your estate collection.